DU LLB Notification 2018 for admission into LLB Course is out and you should secure your brochure at the earliest.Notification of DU LLB is all about the information related to the admission in the Law course. Admission Process will be started in the month of January with the release of the notification. Interested candidate must read the notification carefully, If eligible, register yourself at the official website of DU LLB. The application forms will be released by the end of May 2018. Delhi University will release the DU LLB Application Form 2018 to fill online. You are requested not to mistake offline form with the offline application. The exam will be offline, but the form has to be filled in an only online mode so do not send the application or any document to the university otherwise your application and candidature will be rejected. In order to fill the form, you have to make an account and use your login in and password safe with you for future reference. The DU LLB application form 2018 can be found on the official website of Delhi University. Fill all details and upload a scanned photograph and a scanned signature. You will need to attach a scanned copy of your tenth certificate and a caste certificate and the latter only if applicable. You will also need a copy of your ID card. All documents except the photo and signature have to be self-attested. Self-attested means your signature has to be there and you should write self-attested over there. The max size of the photo and signature document has to be 50 KB. The tenth certificate and the caste certificate have to be 100 KB max. The photo and the signature should be in the right format i.e. JPG/JPEG/PNG and the caste and tenth certificate should be in the right format i.e. JPG/JPEG/PNG/PDF. Valid ID proofs are an Aadhar card, a driving license, PAN card, Voter ID, Passport and college ID card and no other identification will be considered valid. You have to submit a small fee as the DU LLB application fee amount while you are filling the form. This fee is exclusive of the admission fee and is a one-time fee to be paid by all applicants. You are supposed to pay online using a credit or debit card or net banking and for general category the fee is Rs. 500 and for SC and ST and PwD candidates the fee is Rs. 250. Not only should a candidate not be more than 30 years of age in the month of July of the application, but he or she should also not be younger than 21 years of age. A general category student must have obtained a minimum of 50% marks and the university he attended should be recognized. The marks obtained by widows and children of ex-servicemen should be a minimum of 45%. PwD students also need a minimum of 45% marks and for SC and ST students the minimum marks are 40%. The main reason to join DU colleges is all DU law colleges are a formidable force in the legal arena and the placements are quite good. Plus, among other law entrance exam like CLAT, AILET and IPU CET LAW, DU LLB Entrance Exam will give you an edge only if you are graduate. All other Law entrance exams are for 10+2, but DU LLB Entrance Exam exclusively is for graduates. So if you want to keep your options open then you must go ahead and fill the DU LLB Application Form. You shall be appearing in the DU LLB Exam if you are sure that you are okay with a three year DU LLB program instead of a 5 year LLB course. This course is also pretty famous among people who want to study in Delhi in specific. If you are still wondering whether to join DU or not then let me tell you that DU is one of its kind and was established in 1924 which is earlier than most universities in India and the law department is famous for its distinguished alumni who went ahead to become judges, senior counsels, policy makers and legal luminaries. So do not miss the date of DU LLB application. Delhi University has released the DU LLB Application Form 2018. 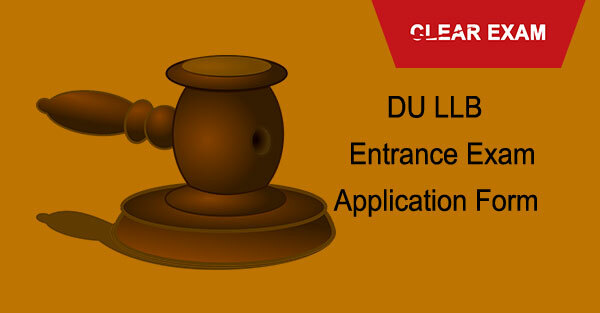 Click to know details for du llb online registration form, application fee.